A decorative wall hanging in a new restaurant in Port Washington called " La Bottega." Love it! Happy Ruby Tuesday! I like that sign a LOT! 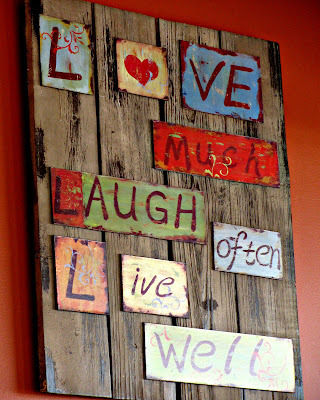 Love the weathered board they have glued the words onto. I love that wall art. Shades of Pink is holding a giveaway for one of my custom Photoverse prints - swing by and check it out! i love the sign, and how it's made. 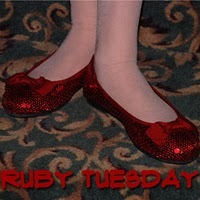 How funny... My Ruby Tuesday post this week is a sign, too. Yours is really good. interesting notes on the wall, very well said. Love the wall art...So Clever! Beautiful words and such an attractive sign. I love that sign. Happy RT. This wall art inspires me. I like to call it inspiration, when I sit wondering; "Can I make something similar"? I'd so like to try. With other words of course. Excellent ! I should hang that at our entrance door ! Nice find. I like what is on that wall art. Happy Ruby Tuesday. I'm seeing it with old patined wood and I'm making it a soon to do craft project. Thank you! A beautiful, inspiring sign with lovely russet tones of red! I am continually delighted by the ruby red photos you find, Mary! This is super! That provides a good blueprint for a satisfying life. Love the wood behind it too. And to look at it and eat a good panini sounds perfect. Happy RT, Mary, I'm too busy at the moment to post, but enjoyed yours. I really love that sign. How unique! Love your red shoe button and the sign. Thanks for sponsoring our Ruby Tuesday meme. Now I'm craving a panini! I love the wall art and the message. Thanks for sharing. Happy Tuesday! Its good to see that sign every morning after you wake up..
Super sign, Mary! And good photo of it, too. Glad you were out having fun. here with my entry this week. nice shot on the wall decorations. cheers! Oh my goodness, I thought they have delicious "p_n__s" lol...sorry, it just my 150/120 vision that reads it so badly. Anyway, i love that wall art. very creative. Love the sign. Great saying. visiting and would love to join this meme...will be back later to post it. It's funny how those words whisper through my heart and mind each day. Wonderful reminder and touch of ruby!! Great sign. Definitely would lure me in. By the way, I love the sentiment you have posted at the top of your blog. I am so so late, I am sorry. Anyway lovely picture though.